So here’s what I’ve found while trying out Myki in the last week or two. On the day it was announced it was being switched-on for trains, I ordered cards for my kids. The cards arrived a few days later, and had the correct names printed on them, and came with the correct cover letters. Apparently some people still haven’t received their cards, and a lot of people got the wrong cover letters. We’ve been trying the cards out, and they seemed to work okay. Most of the Myki vending machines we’ve encountered (apart from day one) have worked for checking balances, and adding money via cards or cash. I like being able to dump all my silver (except five cent coins, and as long as I have a dollar or more) into the machines. Mind you, about a tenth of stations have no vending machine yet, including some major interchanges like Box Hill, South Yarra, Frankston and Ringwood. It’s because Metcard machines are in the best spots. But given most of them are Premium stations, where staff can sell Metcards, I can’t figure out why they haven’t replaced one of the Metcard machines with a Myki machine at each location. The scanners for touching-on and off have worked fine. Sometimes they’re very quick, other times still a little slow. Inconsistent. And the beeps are so quiet you can barely hear them. It does seem to work from within a wallet, as long as you place it flat on the reader, it’s in closest side of the wallet, and there’s only one Myki card in there. I’ve kept an eye on the charges, of course. So far I haven’t seen any errors. Yesterday I even tested a trip entirely in the zone 1/2 overlap (which should be charged at the cheaper zone 2 rate of $2.02) followed by another into zone 1 (which should switch me from the zone 2 fare to the zone 1 fare of $2.94, eg adding another 92 cents). It worked correctly. However one of the failings of the scanner design is that while they show you the cost of the fare you’ve been charged, they don’t tell you what the fare is (eg two-hour zone 1), or when the two-hour block expires (so you know how long you can travel before you get charged more). But where the system all falls down, apart of course from it not being valid for use on trams and buses (fun and games for those train users advised to catch trams and buses when rail services are suspended), is the supporting web site and the call centre. The web site has been hopeless, particularly in the first few days when it seemed unable to cope with demand. And even when it’s working, there are all sorts of niggly things about it, for instance if you request a PDF of transactions, it doesn’t just produce it, but emails it to you later. Sometimes much later. It’s also replete with bad design. When you enter an address, it validates the suburb name, and if you get it wrong (against the official Australia Post spelling) it rejects it, with no clues as to what it should be. For instance, spell “Glenhuntly” without the space (the same way the station name is spelt, but different to the official spelling) and it’s rejected. Many web sites will show you a dropdown list to choose your suburb based on the postcode. Not this one. Apparently it will also reject where a space has been typed at the end of a name (fair enough, but the prompts don’t really tell you what went wrong), and characters in names such as apostrophes and hyphens (so if your surname is O’Doherty-Smith, you’ll have to misspell it). Very sloppy. Some parts of the web site don’t work in some browsers — for instance the Account sections don’t work with Google Chrome and I’m told have problems with some versions of Safari. And some pages are really kludgey. The transaction list defaults to showing you the first activity that ever happened on your card, rather than the most recent, and also defaults to showing only five things at a time. Despite the kids’ cards having been ordered as registered cards, on my account, and the cover-letter stating they were registered, they did not appear on the web site under my account. After we’d tried them out, I went online to add them to my account, eg register them again — which it let me do, even though the cards already should have been registered. When I added Jeremy’s card to my account, I goofed. I mis-interpreted the prompts and accidentally got his card registered to me. The web site now thinks I am both the account holder (correct) and the cardholder (incorrect). I realised my mistake in time to do Isaac’s card the correct way. The web site includes no way of fixing Jeremy’s card. I’m not even sure of what the legal status of the card is — is it registered to him, as that’s what was requested at the time of ordering, his name is physically written on the card, and he was the first to use it? Or is it registered to me, as the web site (and presumably the Myki database) believes? Note that it’s a child’s concession card. I can’t legally use it. 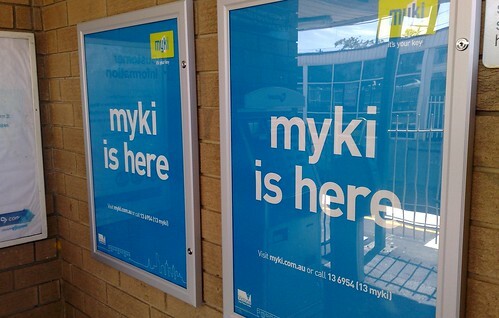 Last Friday I rang up the Myki call centre to see if it could be rectified. The operator was attentive, but clearly had a different view of all the data to that shown on the public web site. Which meant it took about 15 minutes to explain to him precisely what the problem was. And then he spent another 15 trying to fix it. Several days later, I got an email from them, which I thought would be telling me it was resolved. But it bore no resemblance to the problem that had been flagged — it was a form letter telling me how to get a free Myki. Completely useless, and really irritating, as obviously whoever sent the response has ignored whatever the call centre bloke asked for, and treated both of us like idiots. Not impressed. And the PDF report of transactions? I’m still waiting for that. Mostly working on trains, but some improvements needed, and a LOT of work needed on the web site and support services. Yeah, that pretty well mirrors my experiences. The system out in the field works “almost well enough”, but the web site could to with a major revamp. One positive that I’ve found is that the call centre does seem to consistently answer the phone very quickly – not that I should have had to ring them 3 times already. One of my complaints entered through the web site was answered with an email saying “We’d prefer to speak to you – please tell us a number to call you on”. I responded with “I’d prefer email communication”, and next thing I know I get an email saying my case had been closed!! Totally unacceptable. 5) Start pushing big time to get people switched over so that Metcard can be removed, which will allow the train barriers and the tram ticket machines to be replaced. Great summary Daniel, and pretty much mirrors my experience. I’m not looking for trouble, I’m just an early adopter techno geek(the type that lines up at 5.30 AM in the bitter cold to buy the iphone) and so of course I had to have Myki ASAP. Unfortunately I have found trouble pretty much in the same way as you… website issues, retrofitted gates, the beep DEFINITELY needs to be louder at every reader/gate, make it deafening so that as soon as it goes off people can move away from the reader unless they want to see their myki balance. At Hawthorn last night I saw my first “myki crowd” of about four people all touching off at once. Hate to think what that will be like when the system is fully operational, they’re going to need more readers at stations than they currently have. Also re Mike’s comment above the readers need to be changed to show you the expiration time of your ticket if you’re using Myki Money. They do, ironically, show the expiration date if you are using Myki Pass. Yesterday at lunch time I did a little self survey and randomly looked inside ten different trams on Swanston, Bourke and Elizabeth. On ALL of them the Myki Readers were operational and asking to “please touch your card”. (I didn’t get on the trams, just looked through the door.) So it would appear the hardware is *mostly* operational. Here’s hoping they’ll let us use them sooner rather than later. I did sneak a try of my card on a tram the other day when the trains were having problems and it worked fine, touch on/off time was about the same as the station yellow pole readers. Again the issue will be a packed tram all touching off at once. All in all I think the system has much promise, but you are right, I wouldn’t recommend it unless people are willing to suffer a bit of inconvenience every now and again. Hopefully all the problems will be ironed out sooner rather than later. I don’t think they could show an expiry time with Myki Money because it will let you keep travelling until your money runs out. There is no expiry date. I still have $47.98 on my card so it will let me travel all day anywhere. With a Myki Pass it makes sense to tell you when it will run out because it does actually have an expiry date. I used it for the first time last night at Nunawading (on) and Lilydale (off). The scanners took two seconds to register, and that’s about 1.5 seconds too long. It was such a long time that I had no idea whether it was working, thought it wasn’t, and took my card away. Then it said the scan-on had failed, so it had been talking to the card all that time. It needs to display instantly that it is communicating, perhaps say ‘PLEASE WAIT’, before it finally completes the transaction. Otherwise lots of people will think it isn’t working and will step away to think about it. The cards and scanners are the bits I was worried about when I heard this whole thing was being built from scratch, and it appears that my worries were justified. Philip – interesting – I scanned on at Nunawading the other day and it was instant. I wonder if the problem is related to the actual card? Re the expiry time on Myki money – what I’m talking about is that when it activates a 2-hour ticket that I would like to know the expiry time for that ticket. Sure it will keep activating 2-hour-ticket after 2-hour ticket until my money runs out, but I want to know how long I’ve got to travel on the current one until it activates another one. There has been persistent talk of the scanners going into a kind of sleep/power-saving mode after a period of inactivity, which can mean that if the previous scan was quite some time ago, it takes extra time to “wake up” and then read your card and respond. Daniel, comletely agree about the website! how ridiculous that it wouldnt accept “North Balwyn’, i had to try ‘Balwyn North’! We decided to take up the free Myki card for ourselves and the youngest who is waiting to see if she gets into the uni, the eldest is working so we’re leaving her to look after her own Myki. Bear in mind we’re both quite adept with computers and websites, the OH has been in the computer industry for most of 30 years and he was totally unimpressed with the website, very unintuitive and difficult to navigate. He only knew he could do two cards on the same account because I’d read it, here there was nothing on the screen to tell him that, although when he logged in it magically showed that option at the bottom of the screen. We couldn’t get a card for the youngest as she doesn’t fit into the concession criteria, they have pension cards and cards for younger students but nothing for late high school or university students. It is listed on the list but when you go to select it there’s no option to select. …which is another example of the web site being so poor. Why doesn’t it say that on the ordering page, where you’d want to know why the student concession option is missing? I agree with all these comments about the website, particularly the bit about secondary/tertiary students, but the bit that really gets me is that the system has been in use (true, its only a little bit) for over a year now and I can’t believe that our country cousins didn’t have these problems, so that must meant that they have simply been ignored!! I’ve got my card yesterday just because it was free, but wouldn’t use it until everything is fixed and old system will be terminated. What amazes me is that I can only access my details and transactions on the Myki website if I use Internet Explorer, which I desperately try to avoid wherever possible. In Google Chrome, Firefox and Safari (on Windows 7) and Safari on my iPhone the “My transactions” page doesn’t work and the “My details” page simply says “Not found”. For a business to have such limited accessibility to their website these days, especially one that forces you to rely on the site is utterly pathetic. I would lose my job if my development projects only ran in IE. Great article, thanks Daniel. I enjoyed reading about your experiences. Richard, that’s very interesting. I just tried it with IE8 and Firefox 3.5.7 from Windows 7, and it worked identically in both of them, including the two links you specifically mentioned. I wonder why the different results? Thanks for trying out that travel scenario (1st leg in 1/2 overlap, 2nd leg in zone 1) – looks like it’s pulled that one off nicely. But … ahhemm … the website, and the ordering. I ordered 5 cards 30-Dec, but only 4 have turned up, and only the same 4 have appeared in the dropdown list of “Manage Cards”. I’ve sent a message (which they called me back) and a second about this missing card. When the guy called me back, his records were saying that card was sent to AusPost at the same time as the others, somehow I think the records are lying given the same card hasn’t appeared on my dropdown list. Since then I’ve ordered two more cards for my parents. We’ll see how all this goes. None of the cards have been used (coz I’m not looking for trouble). Registration update: I ordered a second card, it showed up on the website today, and i received it in the mail tonight. BUT it had my name on it, and I definitely didn’t tick that box when ordering! I don’t mind, but it just makes them look sillier and sillier. Love the update, I too have ordered Myki card on the 31st Dec and still waiting, I rang them to find out where it was and offered the reference number of my email and the girl nicely told me no we dont need that please give me your name, which I did but when I gave her Michelle she asked how do I spell that? then when I spelt it out shes like oh cool!!! Excuse me? phone ethics out the window there, then i was told to give her my email address all the while I was offering the reference number? nope didnt want it. then I had to proceed to spell out my email address in detail like a for apple, she couldnt even get that! then I made a complaint on the website and that will take 7 days to answer! When I go to high school I use public busses and I have to use metcards. I hate them because I buy daily metcards and when it expires I have to throw my metcard away and it is wasting paper. When myki is released on metropolitain busses I am going to sign up for it. @Richard, yeah I’ve been hassling them about web site compatibility for months and months. Unbelievable they haven’t fixed it yet, though in my dabbling it’s worked okay in Firefox and Safari; no good in Chrome. I’ve heard of others having problems in Safari though. @Kiwi Nick, the other scenario I haven’t tried yet is a trip from Z2 to Z1 to Z2, without touching off (eg Moorabbin to Boxhill via Richmond). Interested to know if it’s clever enough to know you went through Z1. @Michelle, the people I’ve spoken to have been good, but yes, they don’t seem to want card numbers or request numbers; someone’s set their computers up to find you by name. One operator told me there were four Daniel Bowens in there. Given the obvious problems going on, I wonder how many of those are me. @Phill, are you sure you’re not a robot? That’s the third time you’ve made that same comment, in various posts. I’ve seen an estimate for how many Short Term Myki tickets they expect to sell per year. It ain’t pretty. My Myki finally turned up yesterday after ordering on the 31st of December. I am tempted to try it out, but think I will leave it for a few months. I ordered mine with my name on it and it came with the prefix “Mr”. Now I actually am a Mr, but I prefer a more informal style with no Mr on the front. I don’t recall there being a choice, I think there should be. Ben, yeah, there wasn’t a choice. Annoying. That is reason enough NOT to use it ! Myki testing team got on the tram and checked the card readers, then a few stops later another team got on and checked them again. Couldn’t they do them at the depot all at once? I don’t blame you for not wanting to test Myki Pass for them. Given he’s got a pass for both zones, it should never use any money, but the behaviour described suggests otherwise. HS> “there has only been one credit card deduction for a myki pass purchase” … said Mr Fergusson. Ummm… I imagine he might have paid cash when he put the second pass on there? Kiwi Nick I’m using Myki Pass and it’s been fine so far. I know it was a gamble, but it’s been fine for me so far, though my pass was the one that was loaded on my card when i ordered it. I have a feeling we’re not getting the entire story in that article. Not being a Myki apologist, just a realist. No Regrets Kosky huh? So why stand down?? Re: the web site not working in Chrome (and Safari). If you launch Chrome with a fake user agent string, so that it’s pretending to be Firefox, then the account management stuff works fine. So it doesn’t even look like they have to do any re-coding to support Chrome – just change the list of valid User Agent strings. As Daniel says “It’s just not that hard”. I’m guessing (but haven’t tested) that the same trick would work in Safari. Edit: It’s not that clear with the font in my browser that there are *two* dashes in front of “user-agent” in the previous comment. Didn’t work for me Mike. As in Chrome normally, I can get around most of the site, but logging into my account, it doesn’t display the cards. chrome.exe --user-agent="Mozilla/4.0 (compatible; MSIE 8.0; Windows NT 6.0; Trident/4.0; Mozilla/4.0 (compatible; MSIE 6.0; Windows NT 5.1; SV1) ; .NET CLR 3.5.30729)"
chrome -–user-agent="Mozilla/5.0 (Windows; U; Windows NT 6.1; en-GB;rv:1.9.1.7) Gecko/20091221 Firefox/3.5.7"
Weird, it works for me. I’m on Windows 7, using Chrome 3.0.195.38. I just got the same problem by copying my link, and your links – they don’t work. 0030 55 3B 20 57 69 6E 64 6F 77 73 20 4E 54 20 36 2E U; Windows NT 6. 0040 31 3B 20 65 6E 2D 47 42 3B 72 76 3A 31 2E 39 2E 1; en-GB;rv:1.9. 0060 32 32 31 20 46 69 72 65 66 6F 78 2F 33 2E 35 2E 221 Firefox/3.5. Looks like some Unicode madness or something crept in for the second dash before user-agent (the E2 80 93). Try typing the whole string in manually. Then it should work. chrome --user-agent="Mozilla/5.0 (Windows; U; Windows NT 6.1; en-GB;rv:1.9.1.7) Gecko/20091221 Firefox/3.5.7"
Edit: That last link works for me now when I copy it. Did that end up working for you Daniel? Yep, it worked for me. Well done Mike. Now to see if that information on how to fix it can be passed on!